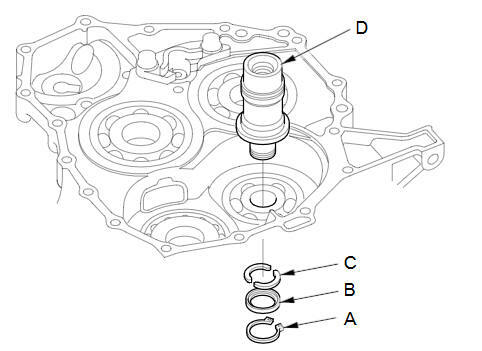 Remove the snap ring (A), the cotter retainer (B), and the cotters (C) from the idler gear shaft (D), then remove the idler gear shaft. Do not distort the snap ring. Check the snap ring and the cotter retainer for wear and damage. Replace the snap ring and/or the cotter retainer if the snap ring or the cotter retainer is worn, distorted, or damaged. Install the idler gear shaft in the idler gear shaft bearing. Install the cotters and cotter retainer, and secure the idler gear shaft with the snap ring.